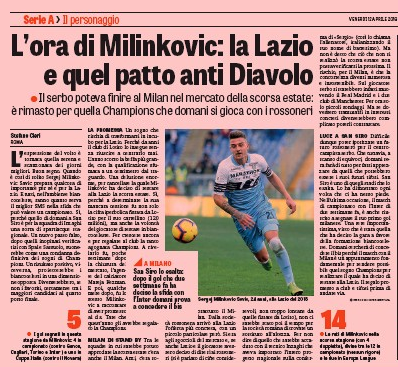 After months and months of silence on the Sergej Milinkovic-Savic front, Thursday brought us the news we were dreading: Manchester United are interested again. Il Messaggero were the culprits, claiming the Premier League club had returned to the fore for the Serbia international, and Lazio were eagerly awaiting them. Claudio Lotito, the Serie A side’s owner, has reportedly slapped a €100m price tag on his star’s back in hope of finally cashing in on a player who probably should have left last summer. He didn’t, and, until very recently, has had a bit of a mediocre season. Fret not, however, as Gazzetta dello Sport have now joined the excitement, claiming that Ole Gunnar Solskjaer’s club is indeed back in business, and has made ‘small enquiries’. We’re guessing that just means trying to find out whether or not he would be interested in leaving Rome for Manchester United in the near future, but there are few details on the subject. No one has come forward yet, probably because the season is still ongoing and we doubt Lazio would give any offer the time of the day for now. But, we all know what this means, and if Milinkovic-Savic continues to improve his form (a goal and two assists in his last five starts), we might end up in a similar position as last year.